Surrounded by mature landscaped gardens with a new 14 x 7 metre pool, sun terraces and fully equipped pool house. Les Cypres has 3 bedrooms, designed with a downstairs bedroom and en-suite bathroom, ideal for holidays with extended family. Large lobby leading to downstairs bedroom and doorway through to open plan kitchen, dining and living area, large fireplace with wood burning stove. Stairs to small landing leading to large double bedroom (additional bed could be added on request), twin bedroom and bathroom. With a large fireplace, exposed beams, terracotta floors and furnished classically and sympathetically with antique French and English furniture and original artworks and prints. Free, fast and unlimited WIFI is included. The Domaine is located in the Aude valley close to Carcassonne and next to the Canal du Midi at Villepinte and can be easily accessed from Autoroute A61(J22), Carcassone Airport (20 minutes) and Toulouse airport (50 mins). We have a large shaded hanger (170m2) with games including table tennis, giant jenga, darts and bar football, this space is also great for an evening aperitif!. There are Children’s swings; and benches to relax in the grounds to enjoy the spectacular views of the Pyrenees and Black Mountains. Bikes are available for a ride in the local countryside; through the vineyards and sunflowers or alongside the Canal du Midi. Many attractions within approx. 1 hour: the Mediterranean coast, Cathar castles, Medieval villages, the Pyrenees, Andorra, the ski resorts of the Ariege, and much more. We purchased the Domaine in December 2012 after doing some holiday inspired house viewing in the Aude. Having spent 15 years holidaying in France, we came to this region and really fell in love with the area as it offers countryside, beaches and mountains all within easy access. This is our first venture into running a holiday rental business and we want all of our guests to love it as much as we do! The Domaine nestles in farmland but is very close to the road network which gives access to all that the Languedoc has to offer. The famous Canal du Midi is only 0.6 km from the Domaine. The Domaine has been lovingly restored to provide 3 stylish Gites, all the comfortable and modern facilities. 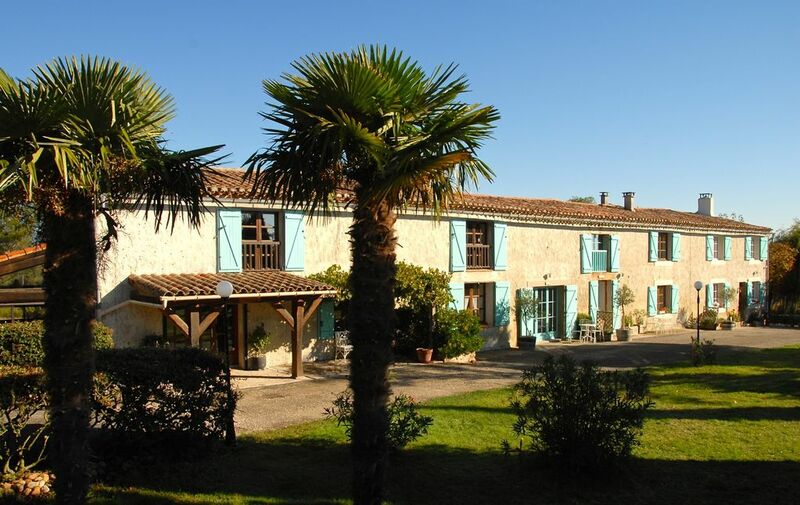 Each Gite is spacious and the grounds surrounding the Domaine are tranquil offering wonderful views of the surrounding countryside and mountains. There are many interesting places to visit within 1 hour of the Domaine. We live at Domaine Saladry alongside our guests and are on hand to offer advice, information and maps on things to do or can respectfully provide guests peace and quiet if required. We have an 8 seater VW Transporter and are happy to drop off/pick up guests from local restaurants or train stations on request and by prior arrangement. The mature grounds offer a very tranquil place for visitors, the views are outstanding and the pool complex has been designed specifically for relaxation and enjoyment by all ages. We have many repeat visitors and we love to welcome them back and has many others coming on their recommendation. Electric radiators in living area and bedrooms. Towel rail in bathrooms. Pots and pans serving dishes fruit/salad bowls Plates and bowls cutlery food preparation utensils. Chess, draughts, dominos in Gite. board games available from owners on request. No electronic games. Small motor boats can be hired from 1 hour from Castelnaudry and Bram. We thoroughly enjoyed our visit to Domaine Saladry- Neil and Vicky are excellent hosts with helpful local knowledge. Carcassonne is close by and the surrounding country side is unspoiled. We especially enjoyed being able to rent bikes from Neil and Vicky to explore the Canal du Midi. The accommodation was spacious, cosy and perfect for our group. A gem of a place, thank you! We had a lovely seven night stay at Domaine Saladry, staying in the Les Cypres gite. The gite was exceptionally clean, well maintained and had everything we needed for an enjoyable stay. The gite complex is perfect for families with the games barn and the swimming pool. We enjoyed a friendly game of ping pong or two and lazying by the pool (when the sun decided to pop out ! We were slightly unlucky with the weather). Neil kindly let us borrow the BBQ and we enjoyed grilling alfresco as well as eating at the many restaurants nearby. Domaine Gayda is a must-do for food lovers, as is L'Ile aux Oiseaux (a charming fish restaurant by the canal). Speaking of the canal, cycling along the canal was a pleasure towards Castelnaudry, watching the boats navigate the locks and discovering the La Boutique De L' ecluse la Peyruque where a local potter sells her work. Vickie and Neil take great pride in Domaine Saladry and their business. They were always on hand to answer any questions and were warm and welcoming from the moment we booked online until the day we left. We would love to return with a larger group in the future, as it would be the perfect place for a holiday with friends or a family get-together. Many thanks for choosing Domaine Saladry for your holiday; and thanks for your positive review. Estuvimos en la propiedad para el puente de mayo. La ubicación de la granja es excelente, muy cerca de Carcassonne, unos 15 minutos, así como de Toulouse. Castelnaudry es la ciudad de cierta importancia más cercana. Es la cuna del "cassoulet", así que bien vale una visita. Domaine Saladry se encuentra a unos pocos metros del "Canal du midi", lo cual lo hace un punto muy interesante para aquellos que realizan la ruta en bicicleta. No era nuestro caso, pero esta cercanía al canal hace que se pueda disfrutar de paseos a lo largo de este muy agradables. En cuanto al domaine, nosotros en concreto nos quedamos en Les Cypres. La casa tiene todo lo que se pueda necesitar para estancias tanto cortas como largas, desde microondas hasta secador de pelo, pasando por plancha. Es una casa muy acogedora y decorada con muchísimo gusto. La propiedad está muy bien mantenida. Yo diría que las fotos de la página web no le hacen justicia. En cuanto a los propietarios, Neil y Vickie, son un encanto, y nos ayudaron en todo lo que les pedimos. Siempre están ahí para hacerte una recomendación de que visitar o donde comer. Sin duda nos parece un lugar totalmente recomendable y estamos planeando ya nuestra próxima visita. Gracias por tus amables palabras. Nos encantaría volver a alojarme si vas a visitar la zona de nuevo! Estos días en el Dominio Saladry de Villepinte han sido perfectos. La casa es tan bonita y tan cómoda que, sin ninguna duda, repetiremos. Estamos muy agradecidos de la hospitalidad de los propietarios, que han hecho todo fácil para nosotros. Lo recomendamos con toda seguridad! Excellent location to visit friends, fantastic grounds, brilliant for kids and for safety, very relaxing pool with spectacular views, plus Neil and Vicky's attention to detail for the gites and their guests is great, inclusive of exceptionally clean and crisp bedding (small things/big impact). A great place and very happy guests - have booked next year. Many thanks for taking time to review your stay at Domaine Saladry, and thanks for your positive feedback. It's great that you have booked for next year, we look forward to welcoming you back. We really enjoyed our 10 days at Les Cypres. The gite was beautifully restored but still retained a traditional ambience. The grounds of La Domaine Saladry are delightful with wonderful views of the Pyrenees on clear days. The nearby Canal du Midi and surrounding towns and villages are ideal for short excursions. Neil and Vickie were most helpful and very knowledgeable about the local region. The peace and quiet we enjoyed there was refreshing. Thanks so much for your kind words. We are so pleased you enjoyed your visit to the Aude and your stay at Saladry and hope to see you again! For cyclists, walkers, and nature lovers the Domaine offers access to walking and cycling for all abilities in the surrounding countryside and hills, or alongside the Canal du Midi. For those more experienced cyclists you may ride on roads or mountains used in the Tour de France. There are numerous lakes in the Black Mountains where you can swim or hire boats. We have a VW Transporter with 8 seats and will be happy to drop off/collect guests and bikes. We are also able to provide wine tours in the Corbieres, Minervois and Limoux AOC wine regions - Please contact us to discuss further. 1 hour drive to Mediterranean beaches. Nearest beach Gruissan plage. 10 hour drive from Eurotunnel Calais. 0.6 km from Canal stop at Villepinte.